Nurse fatigue has been documented in the literature as contributing to negative patient outcomes and poor job performance, both of which may compromise patient care and the health of nurses. Research shows there is a relationship between the hours nurses work and their risk for error. Join Althea Stewart-Pyne and Lisa Ashley as they present “Preventing and Mitigating Nurse Fatigue in Health care” RNAO’s Healthy Work Environment Best Practice Guideline. The myths and facts of sleep deprivation, barriers and strategies to change, and a nurses story will be shared in this engaging webinar. Lisa Ashley, RN, CCHN(C), M. Ed. 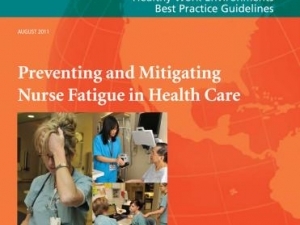 Nurses and other health-care professionals (novice and experienced), interested in evidenced-based recommendations to change the culture of nurse fatigue and discuss strategies to minimize nurse fatigue. Webinar attendees will receive a link to an online evaluation at the end of the webinar. Upon completion of the online evaluation and verification of attendance at the webinar, a certificate of attendance will be generated for your personal education portfolio. No Registration required. Access is Limited! If there is more than one participant per organization, please join the webinar and teleconference line as a group e.g. using one computer and phone line in an office/boardroom.